Eric Davies from Kessel looking good in an IPS T-Shirt! IPS Flow Systems and our manufacturing partner Kessel AG would like to thanks everyone who came to visit our stand at the recent UK Construction Week Exhibition where we exhibited the Kessel range of Pumping Stations, Back Water Protection Valves, and Shower Drain products. We had a fantastic show welcoming many potential new customers and with over 100 leads from this years show, now the work begins! Kessel 3.2 Catalogues ready to go! We have recently sent out a copy of the new product catalogue 3.2 to everyone who registered on our stand. A "must have" reference point for architects, consultants, planners and installers - it contains extensive information on over 1900 KESSEL products including; backwater valves, lifting stations, drains and channels, grease, oil, and sediment separators. 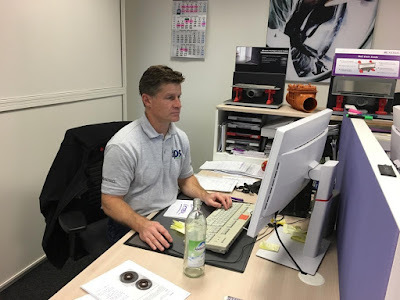 The IPS sales team are ready to deal with your enquiries; and so is Eric Davies from Kessel, looking resplendent in his new IPS/Kessel T-Shirt - so come on let's make them busy! !